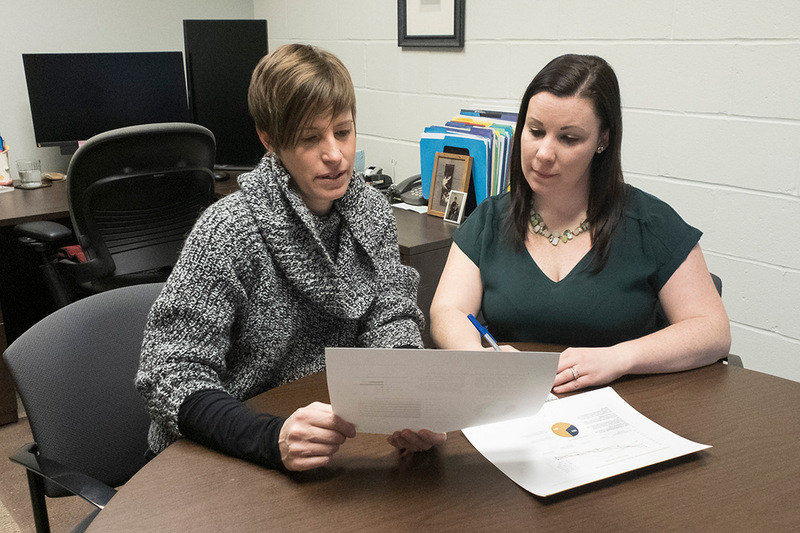 Jennifer Jae Gutierrez, left, executive director of RIT’s Image Permanence Institute, reviews preliminary assessment work with Lauren Parish that will inform and strengthen short- and long-term research goals and institutional planning at IPI. Rochester Institute of Technology has received a $165,000 grant from The Andrew W. Mellon Foundation to support assessment initiatives that will inform and strengthen short- and long-term research goals and institutional planning at RIT’s Image Permanence Institute (IPI). IPI is an academic research center in RIT’s College of Art and Design dedicated to supporting the preservation of cultural heritage collections in libraries, archives and museums worldwide. As IPI plans for long-term research goals that will best serve the evolving needs of collecting institutions, Gutierrez noted, the Mellon-funded initiative will enable research that will engage and solicit critical feedback from collections staff, preservation researchers and conservation educators throughout the preservation community to identify critical research needs and priorities in the field. While IPI’s name reflects its original research focus upon its founding in 1985, the needs of the cultural heritage field have always driven IPI’s research initiatives, Gutierrez said. IPI’s mission, however, is in no way restricted to focusing on image materials, she emphasized. IPI’s current areas of expertise include the preservation of image collections and sustainable practices in preservation environmental management. The institute’s widely recognized environmental management tools are applicable to vast collections in libraries, archives and museums around the world as environmental management becomes an essential need to establishing best practices in long-term preservation storage environments for collections. Assessment activities associated with the Mellon grant will be led by Gutierrez in collaboration with IPI staff and a one-year, full-time preservation research associate project position, and will include online surveys and working meetings hosted at RIT with library, archive and museum leadership professionals, preservation researchers and preservation educators around the world who can speak broadly to the preservation needs of cultural institutions. In addition, a meeting of research-focused colleagues from aligned fields across RIT’s Henrietta, N.Y. campus also will be hosted at IPI “to identify potential synergies and possibilities for collaboration,” Gutierrez said. These research surveys and working meeting discussions will inform how best to define IPI’s research program priorities for 2021-2025, she added. “It is hoped that the working meetings that are part of this project will also serve as pilots for future meetings, and establish a new role for IPI’s research program as a facilitator of multi-institutional preservation research discussions and collaborations,” she said. Establishing a network for regularly discussing preservation research needs and current initiatives at various institutions will enhance research planning at both IPI and throughout the preservation research community. The Mellon Foundation funding also will support IPI staff’s collaborations with nonprofit management consultants in examining current and potential future financial scenarios at IPI to inform strategic planning and growth in ways that best balance mission-driven activities and financial resources.